The photo doesn’t do it justice. Serve with a Greek salad (naturally) and a good, light red wine. Far too long ago I was asked by a reader to supply my recipe for Moussaka, the Greek eggplant sort-of lasagna thing. Truth be told, I’m not responsible for its success. Mrs. E., although not of Greek descent, does far better at my ethnic cuisine than do I. Sort of like my dad learning to speak Greek I guess. Without further ado, just the sort of thing to comfort you on a cold, wet, fall night. Mrs. E.’s Easy Moussaka (well, as easy as it is going to get, anyway). The key to making this easy, like all things, is to attempt to do a couple of things at once. If so, the whole process can take about 45 minutes to assemble- trust me, this is really good for moussaka- and then another 45 to cook. · Start by throwing 2 lbs of ground lamb in a pan at medium heat along with a couple of tablespoons of olive oil, some salt and pepper. · While this is happening, chop up two large onions (bring out that Cuisinart) and chuck them in when you’re done. Let them cook while you tackle the next step: the eggplants. · Slice up (you guessed it!) two good-sized eggplants into rounds of about ¼”, brush them with olive oil, salt and pepper them, and then broil them for about twenty minutes (or as soon as they are soft). Try to flip them over after 10 minutes, but no worries if you forget. The key is that they be soft- not chewy. Again, the Cuisinart works nicely here to save time. Don’t forget to set that timer since you will be multitasking. · By now your meat should be well on its way to being thoroughly cooked. 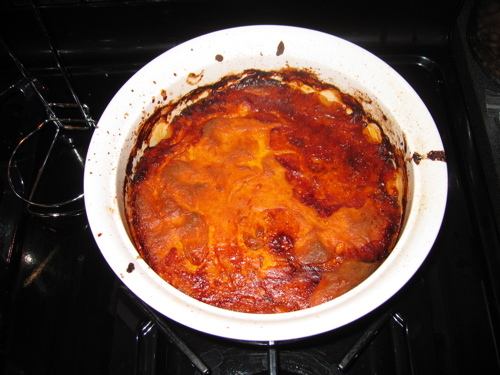 It really is a good idea to get rid of the meat’s excess liquid (i.e., fat) for both health reasons as well as aesthetic ones- the excess liquid has a tendency to sneak up over the béchamel sauce and uglify it- of course, it does look more authentic that way, I suppose. · Now, add a jar of Arrabiata sauce to the meat- the added spice really makes the recipe. A dash… or two… of cinnamon make the sauce feel more Greek. Now let those flavors meld while you complete the final- and sadly most labor intensive- step. · The topping: although it is tempting to skimp or cheat here, only the real béchamel truly satisfies. It adds the necessary flavor , depth and beauty to the dish. I really like the Frugal Gourmet’s version of this but I have slightly modified it. You may want to pour yourself a glass of wine now, if you have not already done so. After all, you will have at least one free hand most of the time. Remember the caveat regarding idle hands! o Beat 6 eggs in a large bowl and put aside. o Start heating 1 quart of milk in a saucepan on medium heat. o Melt 1/3 cup butter and stir in ½ cup of flour to make a roux while the milk heats. o Add the roux to the heated milk with a whisk; continue to stir until the sauce thickens. o Stir in ¼ teaspoon of nutmeg, ½ cup grated parmesan or romano cheese and salt and pepper. o Stir about a cup of the mixture into the egg bowl and then return it all to the saucepan, stirring the egg-mixture combination back into the original topping mixture. o Stir over medium heat until the sauce is thick and rich. · Now put it all together!! Using a 9” x 13” backing pan, spread half the eggplant on the bottom, cover that with the meat sauce, then the remaining eggplants. Top it off with the “Greek béchamel” sauce and you’re ready to start baking. I like to bake it at 400 degrees for about 45 minutes, as close to the bottom of the oven as possible. Others may opt for 1 hour at 350 degrees. Clearly, practice makes perfect and you may find that you like more or less cinnamon or nutmeg, for example. The key is to keep at it until you have found what makes you happy. This entry was posted in Entertaining and tagged eggplant, Greek food, moussaka, recipes. Bookmark the permalink. Thanks so much. I was the reader who asked and I look forward to trying your version. The version that I’ve tried comes from an out of print cookbook and tastes wonderful but takes all afternoon to make. A pleasure, Greg. Apologies for taking so long about it. Mrs. E. was difficult to pin down. On the bright side, I saw some wonderful looking eggplants at the grocery today. Good luck! Sunday, as a child, we would have Sunday Brunch at a lovely spot, and the hostess served “Mousaka” – I have always loved the way she would say – “Would you care for some “Moo-sa-ka?” In a lovely Southern accent. You always add spice to my day! Will be making this recipe tonight. Thanks for your terrific blog – even though I’m female, I find it wonderfully inspiring. My dad, now 80yo, always dressed like this. Wouldn’t have been caught dead going into town in shorts and a t-shirt. I also love seeing pics of your leather couch. Makes me feel better about my own two leather chairs which are similarly darkened at the head and armrests. Welcome Polly! Thanks for the compliment. I’m trying to post more useful things for my women readers, but it’s taking me a while to get comfortable with the territory. Bon appetit.